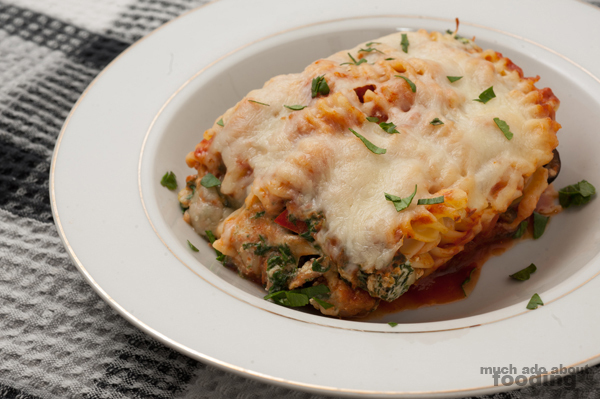 [Original recipe post in December 2010] I'm working on revamping old recipes from when the blog first started. 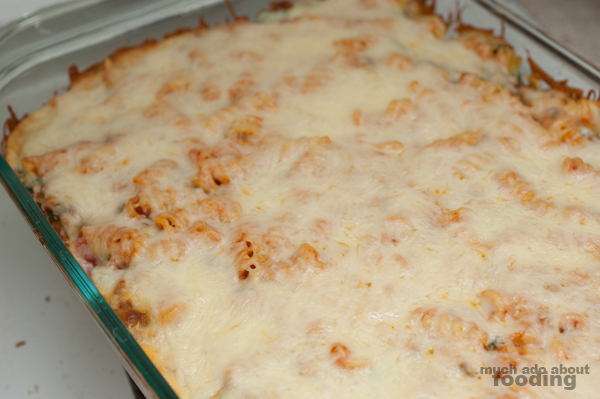 This pasta bake was a staple of my college days because I could work on it in one night's time and manage to eat it throughout the week. 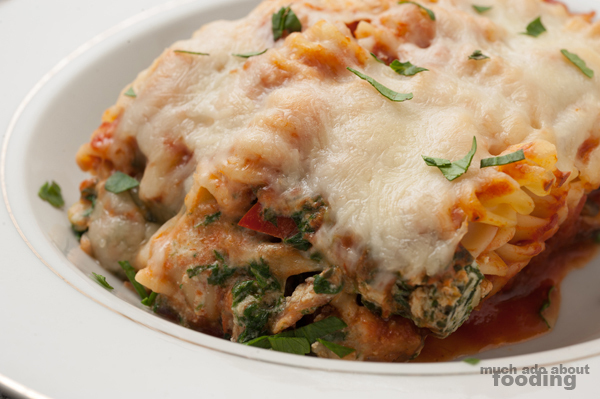 It's baked in a 9x13 dish, stacked quite high so that there is plenty to go around. I have my own version below but you can adjust with some ingredients here and there as you please. I have loved teaching this recipe to other people as well because you end up with something wonderful without need of much culinary expertise. 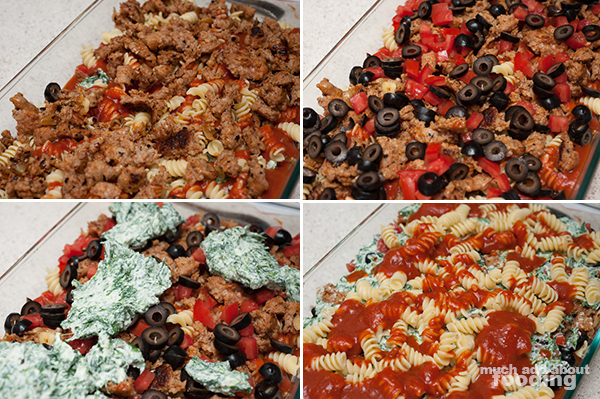 If you are a fan of Italian ingredients and flavors, you'll love this hefty meal. Bring water to a boil for pasta and cook as directed. While waiting for water to boil, add sausage to a hot skillet and break up into chunks. When half of it has browned, add in garlic and red chili flakes; cook through. Drain pasta when ready and boil water again in the pot for spinach. Preheat oven to 325°F. Slice olives and dice tomatoes. Boil and drain spinach, making sure to squeeze out excess liquids. Chop finely and mix with ricotta, eggs, and all herbs. 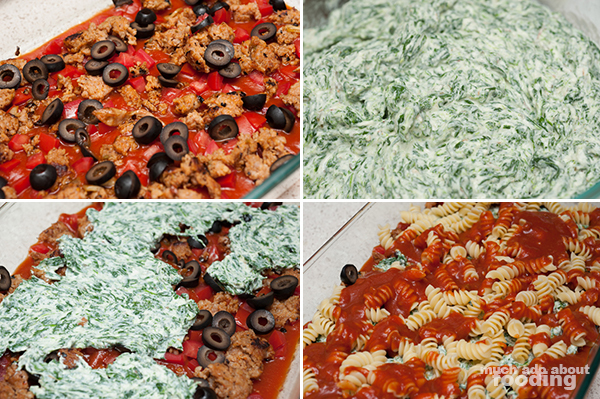 You may choose how to exactly layer the bake but my method involves sauce on the bottom followed by tomatoes and olives, sausage, spinach-ricotta spread, pasta, and repeat. 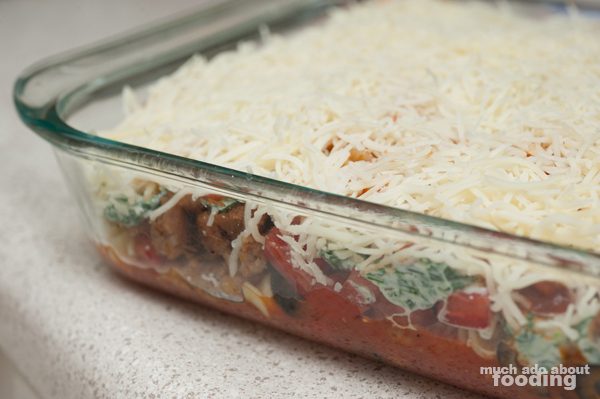 The very last layer is the shredded Mozzarella. Bake for 35 minutes and then enjoy!